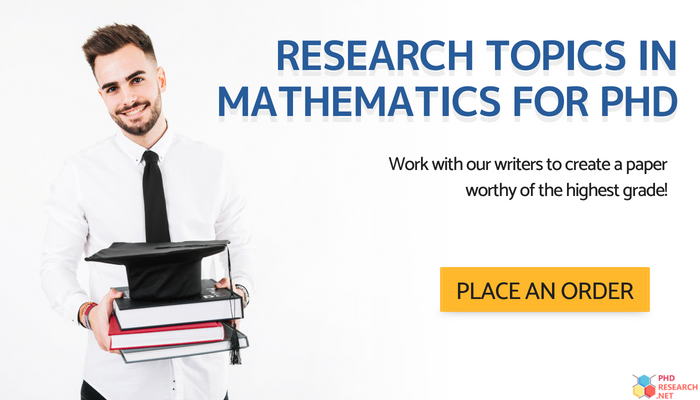 How Do You Find the Best Math PhD Research Proposal Topics? Mathematics involves the study of things such as quantity (arithmetic), structure (algebra), space (geometry), and change (analysis). It is used to study patterns and formulate theories and is essential in many fields such as medicine, engineering, and finance among others. Some mathematical problems require years or even centuries to resolve. In math PhD programs, candidates will have to conduct mathematical research and write a dissertation that makes an original contribution to math in their area of specialization. Mathematics PhD thesis writing service will help you to write a high-quality dissertation. Looking for Phd topics in mathematics is not an easy task. You have to find something that is unique and has not yet been worked on by others. You also have to ensure that it will be important to your field as well as being of interest to you, after all, how will you work on something that you have lost interest in. The project must also be feasible, you must be able to be able to complete it given the time and other resources that you will have available to you. Review your past research: are there opportunities for you to continue work that you have already started earlier in your education? Look at papers that interest you: these will often highlight areas of weakness in current research as well as areas that still need investigating. Brainstorm ideas with others: this can produce far more ideas than working alone as you will get more ideas triggered by what the others have to say. Look at lists: there are many lists such as those that we provide that can help you to decide on the right topics for your studies. The first step in writing a mathematics dissertation is to select the topic you wish to research. In most programs, you will have at least one and possibly two years before you will have to select a topic. A topic must contribute something new to the field and should be something you are genuinely interested in so that you don’t become bored during the year/years you will be working with it. Writing your PhD research paper is not something you will accomplish over a weekend. It is something that will most likely occupy the majority of your time for a year or more. Don’t include unnecessary material: too many students equate length with quality which is not the case when it comes to mathematics dissertations. Only include information that is absolutely necessary. The professors reading your paper will recognize filler for what it is. Proofread your paper: although your paper is in the field of mathematics you still need to watch out for spelling mistakes and grammatical errors. Proofread the paper yourself and if possible have somebody else do so also. Learn the things you have to know before choosing your PhD topics in psychology! Always make a plan: a good plan for your writing will help to ensure that things are done on time and without rushing rather than leaving all until the last minute. Have a target for what you will write each day: this will ensure that you will make constant progress towards completion of your paper. Make an outline: this will help make your writing much easier as well as making sure that you avoid a lot of the rewriting that would occur otherwise. Proofread with care: even a simple mistake could see your paper rejected or returned to you. always carefully revise and check your writing so that it is perfect. It isn’t unusual for students to encounter problems when writing their mathematics dissertation so you shouldn’t be discouraged if it happens to you. We provide dissertation writing help should you run into difficulties with any aspect of the process. Our professional writers have mathematics PhD degrees and know what it takes to develop a successful dissertation. From selecting PhD topics in mathematics to writing your paper perfectly our specialized services will ensure your work will always meet the highest of standards.